Team invites are here! It’s now easier than ever to collaborate with team members in your Littledata account. In the new digital landscape, collaboration is the mother of invention. Our new Team feature lets you easily manage additional users for your Littledata account, so that everybody on your home team – or on a particular marketing or ecommerce project – can view smart metrics and reports for your site. All Littledata accounts now include team functionality. 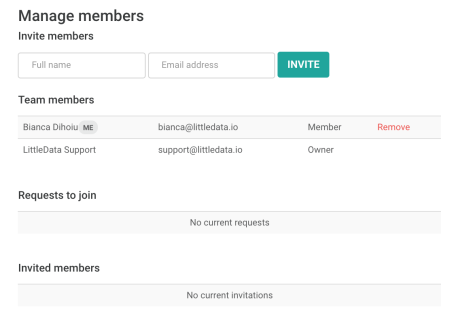 You can invite and manage team members from your Littledata admin. From simply sharing reports to collaborating on complex analytics projects, team invites are a straightforward way to share information and hone down on accurate data, whether you’re currently in the data setup phase or focusing on making and understanding business decisions based on that data stream. Adding team members to your account helps to ensure that your colleagues can take advantage of the automated reporting you set up in Littledata to get a clear view of your online business performance. And it doesn’t stop there. Team members have access to all of the features in your Littledata plan, so you can collaborate on projects such as setting up accurate tracking, benchmarking your site, and running data-driven campaigns based on buyer personas. Note that while you can have multiple team members, there can only be one account owner for each Littledata subscription — and only the owner can use the app to make changes in GA. Team members can view audits and reports but cannot make changes to the connected Google Analytics property using the Littledata app. We automatically limit permissions in this way to ensure that the account owner has oversight on any changes to tracking and reporting. Team owners can always remove member permissions at a later date, so the Team feature is ideal for growing ecommerce sites that want to control who has access to their Google Analytics data when they change agencies or move on to a different project. Your Littledata team might be composed of members from a variety of teams in your office, and that’s okay. In fact, it’s encouraged. Sometimes your marketing department needs a good way to collaborate with your data team, your online merchandising department or your ecommerce site developers. As Littledata offers ways to both fix your tracking and get more relevant reporting, our app often brings new teams together to make smarter decisions. Early adopters of our Team functionality have found it particularly useful for expanding the range of reports they use in Littledata. In addition to finding ways to further enhance custom dashboards and reports, sometimes a team member will notice a particularly relevant report pack that had previously been overlooked, and the metrics in that pack will end up making the biggest difference to your online revenue. To manage team members, login to your Littledata account and go to Settings > Members. You can access the Settings menu by clicking on the gear icon on the upper right, and you’ll find Members in menu bar on the left. From the Members page, you can send new invitations, manage sent invitations, and respond to requests to join your team. In addition to invites, users can request to join an existing team. 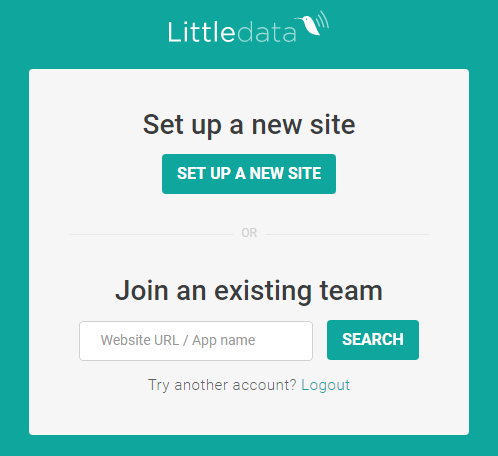 When new users sign up for Littledata or current users add a new site/view to their account, they can search for your site and request to join your team. When someone requests to join your team, you’ll receive a notification at your registered email. You can either accept or remove their request. Wondering how to join a current Littledata team? You can request to join an existing team when you sign up using your Google account or a supported social login (currently Facebook and Twitter). Team member functionality is the logical next step in helping to support sustainable business growth for our customers. Last year we switched to transaction-based pricing because we are dedicated to providing apps and managed services that easily scale with any online business, whether you’re doing $5,000 or $250,000 per month in sales when you first get going with Littledata. Our pricing is per web property (you need a separate account for each particular Google Analytics view or data source), not per user. Standard and higher plans include unlimited team members, but if you need a unique team setup or multi-site dashboard, let us know. We hope you love the new Team feature as much as our team does here at Littledata!